Hayes & Yeading United fell to a third defeat on the trot as they appear to have forgotten the art of defending with three more being conceded, this time against struggling Forest Green Rovers at Church Road. United started the game very well creating many chances in the opening 11 minutes, culminating in an opener from Steve Basham. Dale Binns put Rovers keeper David Wilkinson under pressure in just the fourth minute, forcing the visiting stopper to palm away his angled drive. Minutes later an Adam Green cross from the left was chested by James Mulley to Ram Marwa, his volley being held by Wilkinson. Next to go close was skipper Tom Cadmore who saw a snapshot go over off the top of Wilkinson's crossbar. Seconds later the deadlock was broken, Binns fired a deep corner that Matt Ruby headed forwards, Wilkinson's touch just helping it on to Basham who had the easy task of nodding home. United continued to search for a second, Cadmore fired a free-kick forwards that Basham controlled and shot in one movement, his effort being deflected wide by Mark Preece. 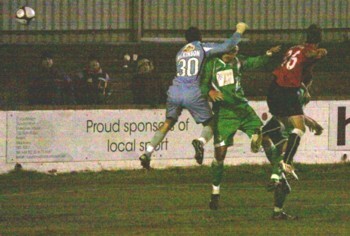 Next attack saw Marc Canham feed Mulley who raced ahead from his own half before forcing a diving save from Wilkinson. 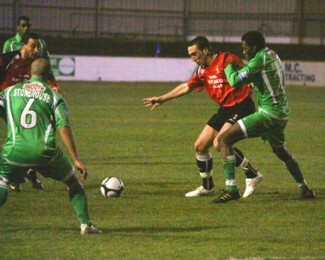 Disaster was to strike the home side in the 22nd minute, Paul Stonehouse fired a free-kick to the far post, Preece outjumped his marker to head across goal and Tomi Ameobi nipped in front of Simon Overland to head the ball into the United net. Minutes later it could have been even worse as a short corner found Conal Platt, his centre was met by a stooping Jonathan Smith but his effort went across the face of goal and wide of the far post. The action died somewhat until with five minutes remaining in the half Danny Powell and Craig Rocastle combined down the left before the former picked out Platt at the far post, his close range effort being superbly blocked by Overland. Forest Green introduced new signing Reece Styche at the interval but I doubt even their manager David Hockaday would have predicted such a dream debut. The first chance of the half again fell to United, Wilkinson sliced a kick into the air, Marwa laid off to Mulley but Wilkinson atoned for his miss-kick by blocking Mulley's shot for a corner. Styche was soon on the scoresheet though, Platt found space on the right, his near post cross was helped across goal by Smith to a grateful Styche who had the easiest of tap in's at the far post to give Rovers the lead. 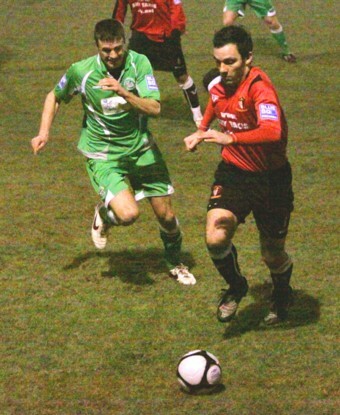 United continued to create the majority of the chances as Garry Haylock threw both Scott Fitzgerald and Craig Watkins into the fray in search of goals. Allen-Page and Mulley exchanged passes on the right before playing the ball in to the feet of Basham who turned "on-a-sixpence" and fired a shot across the face of goal and just wide of the far post. The visitors did briefly break away as Powell found the impressive Platt but Overland comfortably plucked his shot out of the air. This chance aside it was United in the ascendancy, Binns found Fitzgerald at the far post and although his shot beat Wilkinson it came flying back off the upright and when Mulley tried his luck from the edge of the area Wilkinson was well placed to tip over. Platt for Rovers and Basham for United both went close before United's deserved equaliser came with just four minutes remaining. Allen-Page playing in a perfectly weighted cross that Basham rose to flick over Wilkinson into the far corner (pictured below). Sadly for United this strike seemed to cue a touch of defensive slumber as within 30 seconds Platt was given all the time in the world on the right to advance into the area and pick out Styche once more at the far post where he netted his second of the game from about six inches.